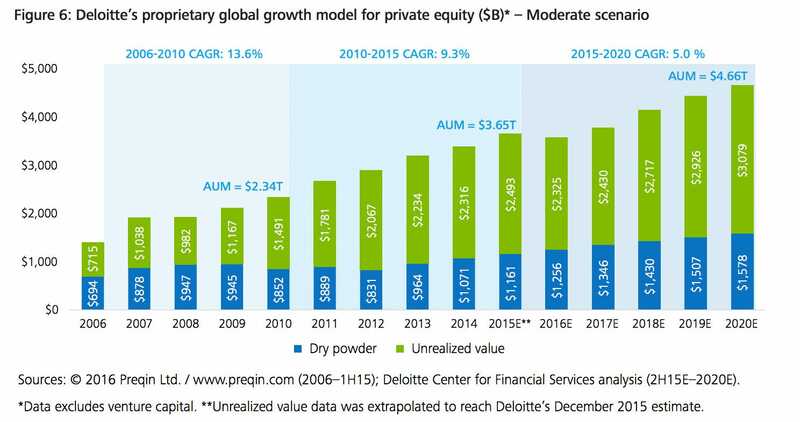 Private equity firms have enjoyed startling growth over the past few years, posting a 13.7% compound annual growth rate (CAGR) since the end of 2005. That compares to a 7.5% CAGR for hedge funds and 7.7% for other asset managers. These private equity firms now manage $3.65 trillion in global assets around the world. Interest rates hikes: The Federal Reserve has put June on the table for a rate hike, and that presents a double-edged sword for private equity, according to Deloitte. On one hand, that could mean more expensive debt for private equity firms (think leveraged buyouts and refinancing deals); on the other hand, valuations may come down, making it cheaper to scoop up companies. Global slowdown: The International Monetary Fund expects global growth to drop to 3.2% in 2016 and 3.5% in 2017. They attributed the weaker outlook to a Chinese slowdown, collapse in oil and challenging emerging markets due to geopolitical risks and commodity plunge. The good days are over: Private equity managers failed to generate significant returns from the era of rich valuations and large deals from 2005 through 2007, according to the report. They are more cautious with their investments, with a large pile of dry powder sitting on their balance sheets. Cutthroat competition: Private equity firms are faced increased competition from other buyers. According to a survey, 60% of buyout managers and 44% of growth managers said they saw more aggressive competition for dealmaking over the year ending in June 2015. One of the underlying forces is corporate bidders that have an even bigger warchest. “Thisonly highlights further the necessity to trying to be creative about the deal structure and figuring out a way to appease the target [company],” Frank Fumai, national audit leader for Deloitte’s private equity practice and one of the report’s authors, told Business Insider. Less choice out there: The number of potential deals is limited. While the number of US companies has barely changed in the past two decades, the number of private equity firms ballooned over the past 20 years. The ratio of US companies to private equity firms was at 17,390 in 1992, compared to 1,393 in 2012, according to the Deloitte report. As of last year, there are 4,910 private equity firms around the world. Private equity’s slowdown has broad implications. These firms are often among investment banks’ best clients, as they are constantly buying and selling assets. Investment banks get a considerable share of their revenue from financial sponsor-related fees, amounting to 20% so far this year, according to Dealogic data. That compares with only 9% in 2000. Disclosure: This website contains the public articles, and this communication is for informational purposes only. Nothing herein should be construed as my opinion, solicitation, recommendation or an offer to buy or sell any securities or product, and does not constitute legal or tax advice. The information contained herein has been obtained from publicly available sources believed to be reliable but we do not guarantee accuracy or completeness. Do not act or rely upon the information and advice given in this publication without seeking the services of competent and professional investment, legal, tax, or accounting counsel.